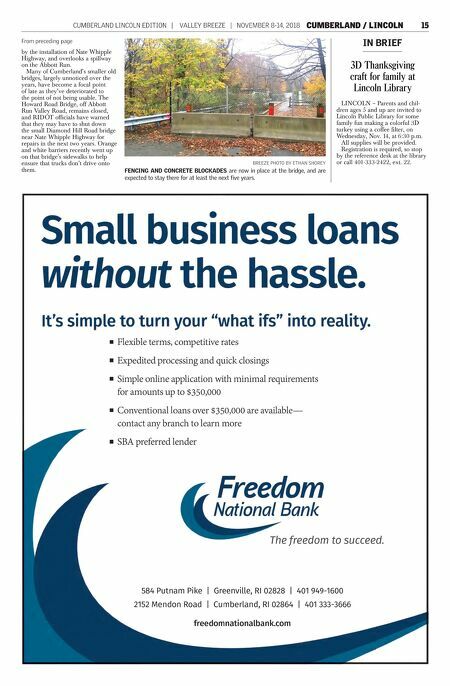 14 CUMBERLAND NOVEMBER 8-14, 2018 | VALLEY BREEZE | CUMBERLAND LINCOLN EDITION doesn't drive through the fence and onto the bridge." According to St. Martin, the bridge is in the state's 10-year plan to be fixed starting in 2023. A recent inspection found that it wasn't even safe for pedestrians, he said. Sterling Vernon, the Sneech Pond Road resident who helped lead the charge to make the bridge more pedestrian friendly nine years ago, said he feels like there has to be a better solution than shutting down the bridge to people who want to walk their neighborhood. Vernon originally organized the Arnold Mills Village Association in hopes of uniting area residents "to let our town and state understand the needs and wishes of the neighbor- hood." He solicited a bid for an inde- pendent engineering analysis and proposals for supporting the bridge for pedestrians. Closing the bridge, he said at the time, "would damage a 300-year history of the village and divide the neighborhood into two segments." Vernon said it's difficult to accept the addition of metal fencing and concrete barriers after all the previ- ous hard work that went into trying to maintain the bridge as it was. With expertise and experience in engineering, he said he's seeking access to inspection reports of both 2012, when the bridge was deemed fine for pedestrians, and 2018 to ver- ify whether the bridge is substantially different than it was before. If not, he said, he'll be convinced this was a "move of convenience, not a move of engineering and data." Vernon said he's been under the bridge, and is "not a complete moron," and it doesn't appear that the bridge has deteriorated very much. "I don't want to rankle the DOT, but at the same time, this feels like a very unfortunate distraction that is very damaging not only to this small part of the neighborhood, but also the history of Cumberland," he said. He added that he was discouraged upon contacting RIDOT that nei- ther the aesthetics nor the history of the bridge seemed to be taken into account. It appears that town officials also aren't interested in trying to intervene, he said. The bridge serves local traffic on rural Sneech Pond Road, off Nate Whipple Highway in Arnold Mills. Since its closure, cars often turn around in neighborhood residents' driveways. Neighbors back in 2009 had asked state officials to create a more aes- thetically pleasing barrier to vehicles in a village listed on the National Register of Historic Places. The DOT expressed willingness to upgrade the barriers, and RIDOT officials agreed under the condition that no cars would cross it. The bridge sits in a national his- toric district. RIDOT's comprehensive bridge inspection protocols require a thorough inspection of all structur- ally deficient bridges every year. Should a finding result in a change in conditions that create a safety hazard, RIDOT moves immediately to restrict or prohibit travel over a bridge. This bridge is included in RIDOT's 10-year plan for improvements, beginning work in 2023. RIDOT's bridge program utilizes an asset-man- agement driven approach to identify and schedule repairs and bridge replacement projects while consid- ering many factors, including the bridge's condition and the volume of traffic that uses it, said St. Martin. The Arnold Mills Bridge was first built in 1886 and reconstructed in 1985. It was bypassed in the 1950s BRIDGE From Page One BREEZE PHOTO BY ETHAN SHOREY Plantings and fencing were installed on the ARNOLD MILLS BRIDGE on Sneech Pond Road years ago, but RIDOT officials say some people were still driving onto the bridge, which is why they've shut it down to pedestrians. Continues on next page Custom Cedar • 100% Virgin Vinyl PVC Aluminum/Steel COMPLETE LINE OF RESIDENTIAL & COMMERCIAL FENCING Chain Link: Galvanized & Vinyl Coated • Gates 401-769-2575 fax 401-766-2956 www.nsfenceri.com 375 St. Paul Street, North Smithfield, RI (5 minutes from MA, off 146A) RI. Contractor's Reg. #6112 Full Insured Fencing materials available for the Do-It-Yourself Install. Visit our display yard or contact our staff for any questions you may have. 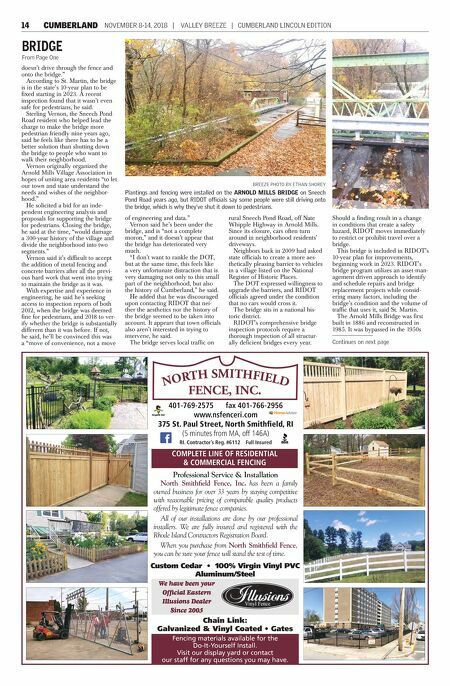 We have been your Official Eastern Illusions Dealer Since 2005 Professional Service & Installation North Smithfield Fence, Inc. has been a family owned business for over 33 years by staying competitive with reasonable pricing of comparable quality products offered by legitimate fence companies. All of our installations are done by our professional installers. We are fully insured and registered with the Rhode Island Contractors Registration Board. When you purchase from North Smithfield Fence, you can be sure your fence will stand the test of time.